Rounded shapes and shimmering gemstones remain captivating and eye-catching anywhere and when a ring has these attributes, it has to be noticed. 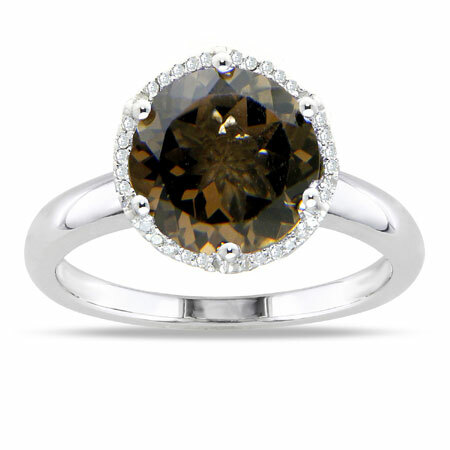 This smoky quartz and diamond halo ring is a stunner with its 925 sterling silver frame which forms a lovely rounded feel around it. The 4.38 Carat, round-cut, smoky quartz gemstone is firmly placed and secured on a round-shaped sterling silver base resting on top of the ring. Glimmering all around the cute 10.00mm gemstone are thirty-six, 0.11 Carat diamonds which combine to form a lovely halo, ravishingly beautiful to the eye and certainly a pride to the lady wearing it. We guarantee our 10mm Round Smoky Quartz and Diamond Halo Ring in Sterling Silver to be high quality, authentic jewelry, as described above.